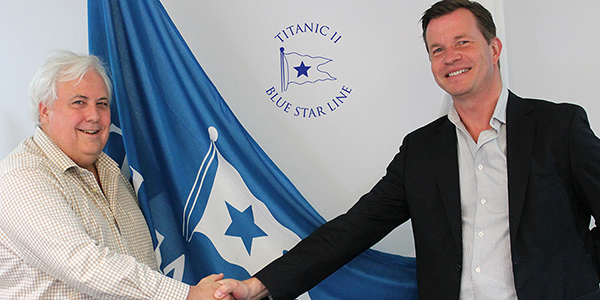 Blue Star Line engages Tillberg Design of Sweden to provide architectural & design services for the interior of the 'Titanic II' project. Titanic II, a full scale version of the original ship, is being designed by the Finland-based Deltamarin and will be built by leading Chinese shipbuilders CSC Jinling Shipyard. The replica of the original RMS Titanic, is scheduled to sail from Southampton to New York on her maiden passenger voyage in 2016. Blue Star Line Pty Ltd Chairman Professor Clive Palmer said the engagement with Tillberg Design of Sweden was retained this month and includes the design of the first, second and third class accommodation, smoking room, first class lounge, Café Parisian, grand staircase and modern features on the safety deck. Fredrik Johansson, Tillberg Design of Sweden partner and senior architect, said the Swedish company is thrilled to be associated with Blue Star Line and with this exceptionally exciting and prestigious project. “The whole concept of building a period replica is naturally to give an experience that is as close to the original as possible,” he said.